The RDB3 Cerceris quinquefasciata is a medium-sized yellow and black wasp which nests gregariously in areas of bare sand in places exposed to the sun. It provisions its nest with adult weevils, and may occur in numbers at favourable sites. It is a national Biodiversity Action Plan species currently subject to research into its autoecology. It is included in English Nature's Species Recovery Program because of a severe decline in its modern distribution. This is thought to be due to the loss of open areas of sandy ground for nesting and flower-rich sandy grasslands for foraging (Action Plan in UK BAP, Tranche 2 volume IV - invertebrates). 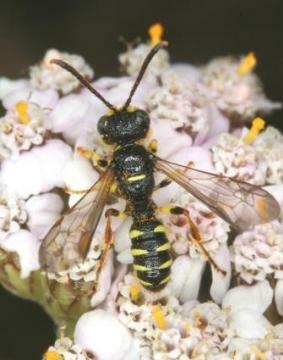 Although the wasp has historically been recorded from 49 ten km squares in southern and eastern England, it has been found in rather few ten km squares, largely in south-eastern England with one isolated occurrence in Oxfordshire. It is currently known from 32 10km squares in Essex and Suffolk, making these counties of great significance for this species nationally. The main national metapopulation currently appears to be in the East Thames Corridor, but other important centres survive in the Colchester, Ipswich and Breck areas. The distribution map here needs to be interpreted with the understanding that recent sites have been lost and many more are under huge development threats. Many or most sites where the wasp is currently known or has recently been recorded are threatened or have already been lost to development, this affecting most of the sites in the East Thames Corridor and the Colchester and Ipswich area. It appears crucial to make serious attempts to safeguard these core areas of population (Harvey, 2001b). Although the wasp appears to collect common and widespread weevils as prey to provision its larvae, the species is associated with sporadically disturbed land (including brown field land and 'waste ground') and the relatively unmanaged parts of heath edge or other sandy habitats. The restricted distribution of the wasp is probably partly climatic, but also reliant on an abundant prey supply associated with grasslands and scrub containing a diverse flower-rich vegetation with areas of bare ground and uncut stems, seeds, flower heads and fruit heads that support the weevil prey species (Harvey, 2001b; Harvey, 2002b).